The 2017 Abu Dhabi HSBC Championship golf tournament on the European Tour is taking place this week from January 19-22, 2017, at the Abu Dhabi Golf Club located in Abu Dhabi, United Arab Emirates. Here is a list of the playing field for the 2017 Abu Dhabi HSBC Championship focusing on the top players. Rickie Fowler is the defending Abu Dhabi HSBC Championship champion as he won the tournament last year in 2016 and Rickie Fowler is back in 2017 to defend his title. Rickie Fowler is part of a very strong playing field this week at the 2017 Abu Dhabi HSBC Championship. Other top ranked golfers in the playing field include Rory McIlroy, Dustin Johnson and Henrik Stenson who are ranked #2, #3 and #4 in the world respectively. Also highly ranked and in the playing field are Alex Noren, 2016 Masters champion Danny Willett, Branden Grace, Matthew Fitzpatrick, Rafa Cabrera Bello, Tyrrell Hatton, Andy Sullivan, Chris Wood, Bernd Wiesberger, Thomas Pieters, Byeong Hun An and Lee Westwood. All those players are in the top 50 in the world. Players ranked from 50 to 100 in the world in the playing field include Martin Kaymer (3-time winner of this event), Thongchai Jaidee, Joost Luiten, Scott Hend, Thorbjorn Olesen, Victor Dubuisson and Kiradech Aphibarnrat. Previous winners of the Abu Dhabi HSBC Championship in the playing field not listed above include Gary Stal (2015), Pablo Larrazabal (2014) Jamie Donaldson (2013) and Robert Rock (2012) from England. 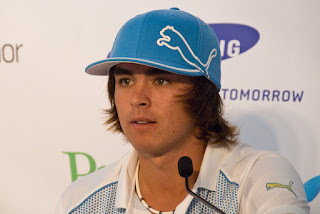 Joining Rickie Fowler and Dustin Johnson in the playing field are fellow Americans Paul Peterson, Daniel IM, David Lipsky and Peter Uihlein. Phil Mickelson is not playing here this week but he did tie for 2nd place in the Abu Dhabi HSBC Championship in 2014 with Rory McIlroy. Rory McIlroy has four 2nd place finishes in this tournament. Can he win it this year? All in all the 2017 Abu Dhabi HSBC Championship playing field is very strong. This should be a very competitive European Tour event and if Rickie Fowler wants to defend his title he's got his work cut out for him this week.